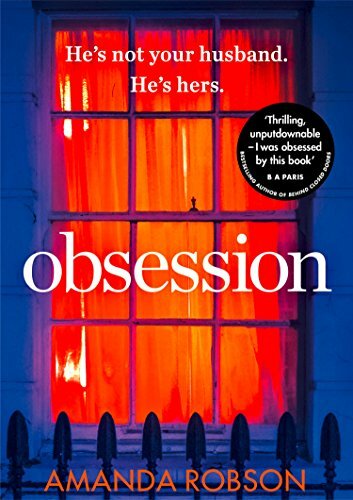 Obsession is the story of what happens to two couples when a seemingly light-hearted question – “Who would you go for if you could?” – sends their lives spiralling out of control. Carly asks husband Rob this question one evening and although he doesn’t initially want to answer, she persists and he gives the name of her friend, Jenni. Carly becomes obsessed with this affair that doesn’t exist and quickly relationships between Carly, Rob, Jenni and Craig take a dark turn, as the obsessions threaten to destroy their friendships and marriages. I have to say that I did not find any of the characters particularly likeable. Even those who initially seemed to be the injured parties soon came to show their own dark sides. It’s a slow burner of a read with the story really developing more for me in the second half of the book. There are plenty of dark themes explored such as extreme jealousy, obsession of course, depression, alcoholism, religious zeal and mental health. There are plenty of twists throughout the story and with the short snappy chapters told from all the characters’ points of view, it’s a book where you may be tempted to keep reading ‘just one more chapter’. But which of these characters could you actually trust to be telling the truth? I really didn’t know and with all four of the main characters so completely absorbed in their own interests, I really couldn’t predict how things would end. And what dramatic and completely unexpected events take place in the latter stages of the book. That one little question at the beginning of the story was only the start of a downward path that would lead to disastrous consequences. I did find the story a bit slow to begin with and the fact that I didn’t really like any of the characters made it difficult to engage with them, but it was worth persisting with for the closing stages of the book which were cleverly and shockingly written. If you have been following the blogtour, you will already have read five things you didn’t know about the characters in the book. Now read on to find out five things about author Amanda Robson. I would have liked to be an actress in another life. The skills of acting and writing seem to overlap, as in both cases we imagine what it is like to be someone else. When I write I act out each scene in my mind. It takes me back to my teenage roots when I loved amateur dramatics. My first great passion. My passion for writing came later. As a teenager I never imagined the hours I spent at Formby Theatre Club would prove useful for the rest of my life. Sitting in a bar on an Austrian ski-slope, dance music pounding out, I recently discovered that I like house music. Until a few weeks ago I didn’t even know what it was. It is influenced by 1970’s disco music. I was a teenager in the 7O’s, a child of the sixties. Maybe that is why it appeals to me so much. House music’s pounding beat is soulful and relaxing. Sitting listening to it makes me feel that I am having fun, and having fun is what life is about. Fun here and now. Here in this moment. Even though I write psychological thrillers, I like reading literary fiction. Writers whose work I particularly admire include Chimamanda Ngozi Adichie, Christos Tsiolkas, John Updike, and Sebastian Faulkes, although in truth the list is endless. It probably depends which day of the week it is whose work I pick. When I am on holiday I like nothing better than to sit on a beach and read a book a day. If you are a read-a-holic, there really isn’t enough time in one lifetime to read everything you want. I prefer contemporary work by a long way to classics. Writing style and use of language has tightened up and moved forwards. It’s good where we are right now. I have sailed across the Atlantic on a clipper ship. We had freak good weather. Wall to wall sunshine. Writing to me is not a chore, but a pleasure, a way of life. I find writing relaxing because it takes me to another world. Every morning when I step into my study and close the door, I press a button in my mind and go wherever I want. Such freedom. Such peace. Thanks to Helena at Avon Books for my copy of the book. At the time of writing it is on offer at only 99P for the Kindle edition which you can order here. You can also buy in paperback from any good bookshop.